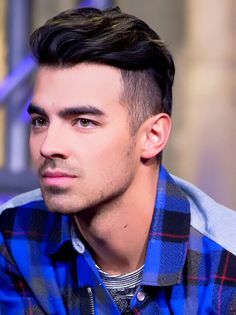 Joe Jonas is an American singer and actor who rose to fame as a member of the pop rock band the Jonas Brothers, alongside his brothers Kevin and Nick. Jonas Brothers gained popularity from their appearances on the Disney Channel television network. In 2011, Joe released his debut solo studio album, Fastlife, which achieved remarkable success. He formed the funk-pop band DNCE in 2015. Born Joseph Adam Jonas on August 15, 1989 in Casa Grande, Arizona, he grew up in Wyckoff, New Jersey. His mother, Denise Marie, is a former sign language teacher and singer, and his father, Paul Kevin Jonas Sr., is a songwriter, musician, and former ordained minister at an Assemblies of God church. He has an older brother, Kevin, and two younger brothers – Nick and Frankie. Joe began his career at age 12 appearing in Baz Luhrmann’s production of La Bohème on Broadway. In 2016, he began dating Sophie Turner. They got engaged in October 2017. He previously dated Taylor Swift, Ashley Greene, and Gigi Hadid. Father: Paul Kevin Jonas Sr.
*He was born on August 15, 1989 in Casa Grande, Arizona, USA. *His ancestry includes Italian, German, Irish, English, Cherokee, and French-Canadian. *He wanted to be a comedian before becoming a musician. *Played keyboard, guitar, and tambourine for The Jonas Brothers. *His favorite actresses are Aishwarya Rai Bachchan and Natalie Portman. *Johnny Lang is his favorite singer. *He is close friends with Alexa Nikolas. *He is a fan of Britney Spears. *Engaged to Sophie Turner in October 2017.